I wanted to decorate for "Back to School" but couldn't find any ready made decorations in the stores. So I decided to make my own. One of the decorations I made was a "Back to School" wreath. 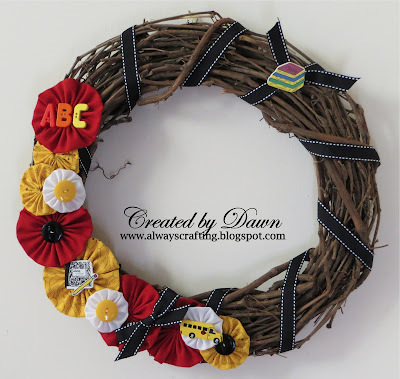 First, I used black ribbon and wound it around the twine wreath. Then I added different size yo yo's in coordinating fabrics. Added buttons and wooden school themed items, and some bows in the same black ribbon. I also have made table runners and a flower arrangement. Hopefully, I will have time to post pictures of those projects as well. This is so lovely, really fun! Very well done, so original.